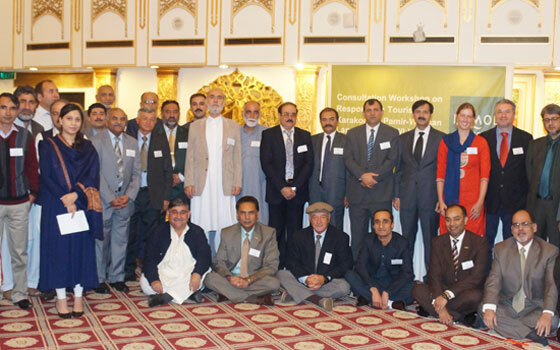 Participants of the workshop “Responsible Tourism in Karakoram-Pamir-Wakhan Landscape” pose for a photo at the Marriott Hotel in Islamabad, 3-4 November 2015. The International Centre for Integrated Mountain Development (ICIMOD) organised a two day workshop “Responsible Tourism in Karakoram Pamir Wakhan Landscape” (KPWL) from 3-4 November 2015 at the Marriott Hotel, Islamabad. The workshop was an exchange of ideas and experiences with regard to the Khunjerab Pamir Culture Festival 2015, responsible tourism in the mountain areas of Pakistan and options like eco-tourism development as possible alternative livelihoods in the region. During the technical sessions, experts from ICIMOD, WWF Pakistan, Tourism Department and Forest, Wildlife and Environment Department from Government of Gilgit Baltistan, Government of Khyber Pakhtunkhawa and Government of Azad Jammu and Kashmir made presentations on the current status, issues and opportunities of tourism in the region and how to integrate ecotourism with responsible tourism. Representatives from community and private sectors like Khunjerab Villagers Organization (KVO), Gilgit Baltistan, Shams ud Din, Chitral Association for Mountain Area Tourism (CAMAT), Chitral and Mr Siraj ul Mulk, Hotel Hindu Kush Heights, Chitral also shared their views on scope of ecotourism in KPWL. The workshop concluded with vote of thanks by Muhammad Ismail, associate coordinator, Karakoram Pamir Landscape Initiative, ICIMOD.